"Ph'nglui mglw'nafh Cthulhu R'lyeh wagn'nagl fhtagn." "In his house in R'lyeh dead Cthulhu waits dreaming." 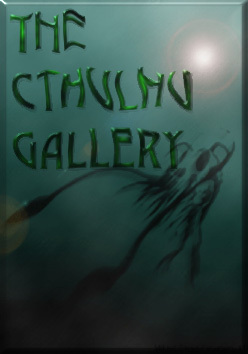 Welcome to the Cthulhu Gallery ! According to your bandwith, browser and time, two versions of the gallery are presented. IMPORTANT : I am trying to get as many permissions as possible for the reproductions of Cthulhu pictures for the gallery. There are yet some pictures with unknown or unreachable author. Please tell me if you know any of them or how to reach them. I want to contact them by myself to ask for permission (it worked quite well so far). This page is also part of the ultimate guide to SF/fantasy art.